Hello! 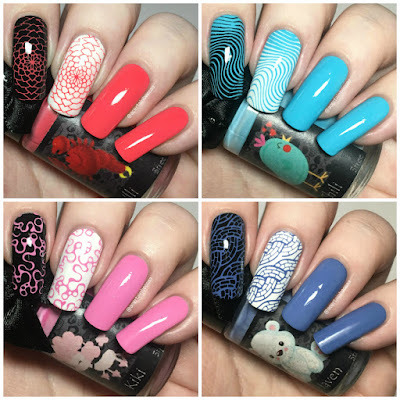 Today I have four of the new Esmaltes Da Kelly stamping polishes to share with you. These have just recently been released on Rainbow Connection, along with the textured Little Princess collection (see my swatches of two of those here). I have shown the four polishes stamped over both black and white, and also on their own as a regular polish. Read on for a closer look at each polish and more info! For all of my swatches, I used Pretty Serious 'Absence' (black) and 'Presence' (white), and Creative Shop stamping plate 17. These were also all from Rainbow Connection - I will add any links at the bottom of this post. First up is 'Ulli', a bright pinky red represented by a lobster. I used it to stamp the rose pattern as I thought the colour fit quite nicely. This is a bit thick when applying as a normal polish, but is very opaque. I found it slightly streaky on the first coat, which evened out after a second. It dries down matte so I would recommend topcoating. Next is 'Chili', a bright blue represented by a cute little bird. 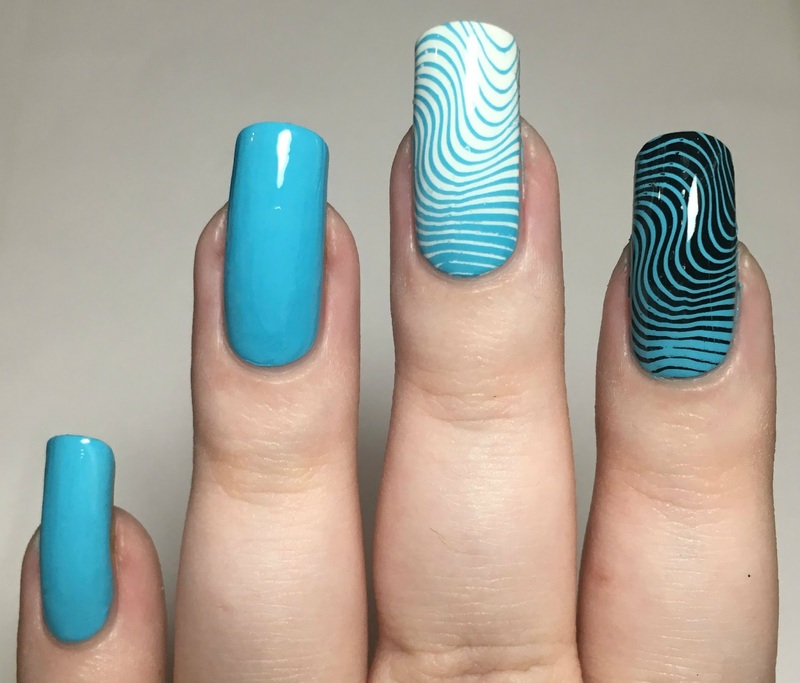 I went for the sort of optical illusion lines for stamping. Again this is a bit thick when used as a regular polish, but is easy to apply. It is definitely a one coater. It dries just slightly more glossy than 'Ulli', but still benefits from a topcoat. 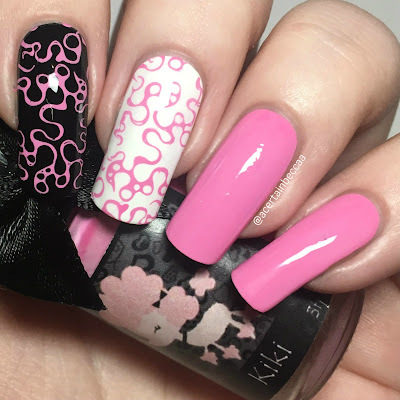 Next is 'Kiki', a bright pink represented by a poodle. I paired this with the splodgy/bubbly pattern on the plate. This is another one coater when applied on it's own, but again is on the thicker side. It dries down matte so I did apply a topcoat. 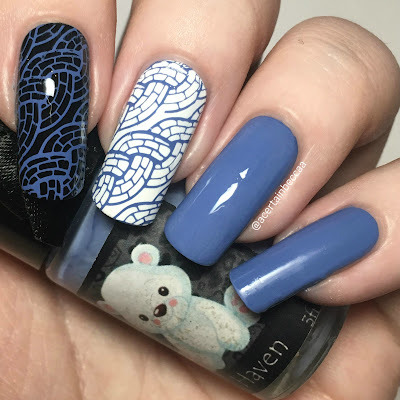 Last up is 'Haven', a dusty grey-toned blue represented by a cuddly white bear. I stamped using the celtic knot/plaited design. Similar to the last two, this is a bit on the thick side when applying, but is a definite one coater. I also left my little finger without topcoat for this one so you can see the matte finish. What do you think? I really like them! I found all four so easy to stamp with, they picked up each image so clearly, including smaller lines which can be tricky. I was also really impressed with how they performed as 'regular' polishes. They were on the thick side (as is normal for a stamping polish), but still much easier to apply than I expected. I definitely recommend getting your hands on some of these! You can find all of the new Esmaltes Da Kelly stamping polishes on Rainbow Connection here ('Ulli' here, 'Chili' here, 'Kiki' here, and 'Haven' here). You can also find Pretty Serious 'Absence' here and 'Presence' here. Creative Shop plate 17 seems to be sold out, but you can find others here. 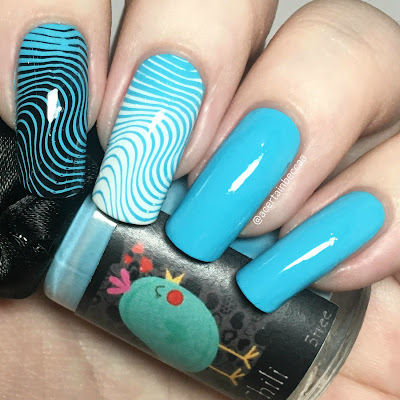 I LOVED the chili and the kiki swatches they are gorgeous nail polishes and the blue one are my favourite one, i just can't resist a stunning blue! 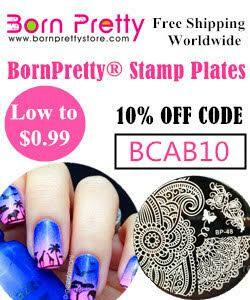 The stamping is so clear! Your manicures are so fun! 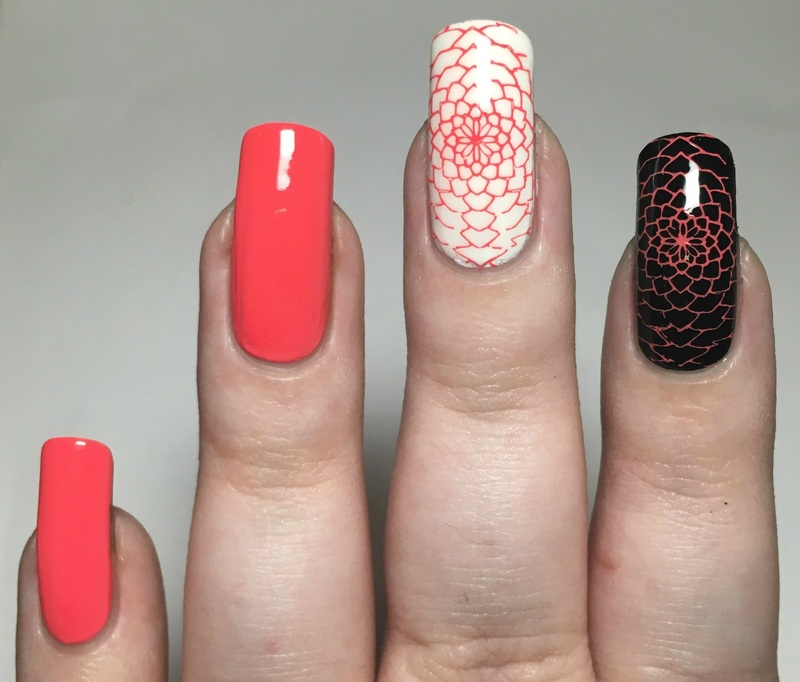 I was so enamored with the stamping I didn't pay attention to the polishes! 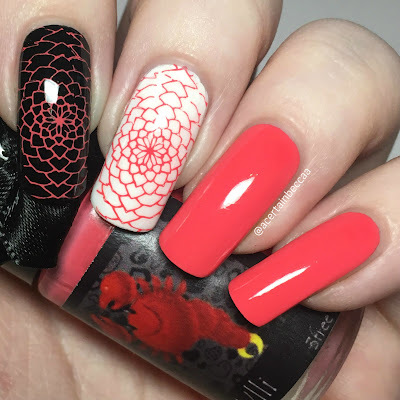 Gorgeous stamping and gorgeous colours! Gosh. I'm so wowed by the delicate and intricate stamping patterns. 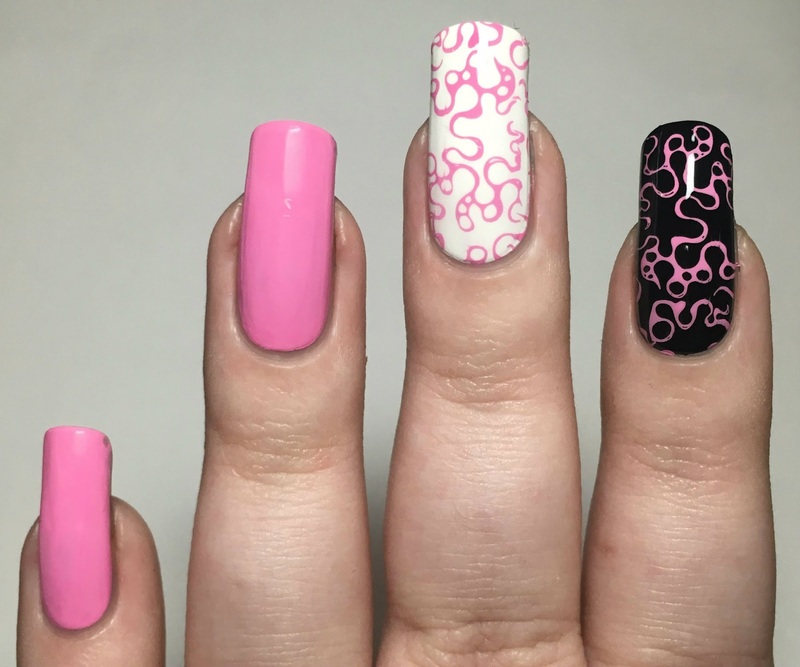 They are as perfect as nail wraps/press-ons. Oh wow, these look great! Especially the blue and the purple! 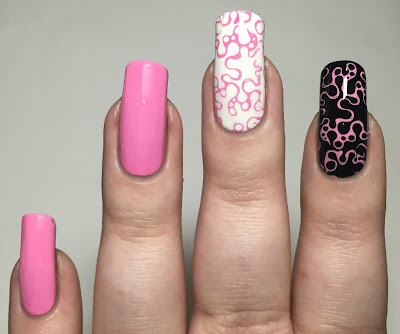 Perfect stamping! These are the best polishes. Those stamps are probably the crispest I have ever seen. Amazing stamping. Love the packaging on these polishes! wow these look great! i love the pink!! I love all of the manis. I wish I could learn to stamp.